It took awhile, but I finally saw Moneyball. Everyone told me I needed to see it and I have to say the movie was very well done and I really enjoyed it. I'll be honest, I don't have a huge recollection of what was going on with the Oakland A's that season. Being a National League girl, I was busy keeping up with the Braves and the teams they were competing with. It was really fascinating to see how the approach of Billy Beane and Peter Brand changed the status quo of the way a major league baseball team can be assembled. I also got a kick of seeing former and future Braves portrayed in the film. And now I'll add Moneyball to the list. Did I miss any? And what about Brad Pitt and Jonah Hill? Were their performances Oscar worthy? I was wondering what that ruckus was yesterday. Had Kilauea erupted again? Was there an earthquake somewhere? Then I understood. It was Detroit, the jumping up and down, the yelling and screaming, the sheer joy and excitement of Prince, their Prince, coming home to the kingdom where he grew up. Once again, I didn't see this one coming. I really need to polish my crystal ball! But seriously, who was expecting this? Two weeks ago the Tigers weren't in need of a 1st baseman, especially one who wanted a long-term deal. Even a week ago, Tigers management was looking for a short term fix for Victor Martinez's season-ending injury. Did Tigers owner Mike Ilitch pull the trigger once again? The Tigers have made moves late in the off-season before and they've worked out well. Pudge, Mags and Damon. And Ilitch, he wants a World Series...badly. How badly? In Prince's case, 9 years, $214 million kind of badly. There will definitely be a on-field ripple effect with Miguel Cabrera moving back to third base. What does that mean for Brandon Inge and Wilson Betemit? We'll have to wait and see. There are a lot of changes going on in Motown. And the one big change they're waiting for, hoping for, involves the last win of the season and lots of champagne. Can their Prince also be their savior? Braves fans, it's time to update your score card. Spring Training is right around the corner (YIPPEE!) and I thought it would be a good idea to remind y'all of the changes that have occurred during the off season. A few of these changes came as no surprise (Derek Lowe) and the one big surprise to me is that there hasn't been a big signing. The good news about that? The Braves have a stellar farm system!! Michael Bourn - Avoided arbitration. The Braves have him signed through 2012. I'm really glad we have him for the entire season. Brooks Conrad - Non-tendered. He's since signed with the Brewers. I'll miss the Raw Dog. Robert Fish - He's a LHP acquired via the Rule 5 Draft from the Angels. Eric Hinske - The Braves exercised his 1-year option for 2012. Yay! Jair Jurrjens - Avoided arbitration. The Braves have him signed through 2012. Scott Linebrink - Free agent. The Braves chose not to pursue. Derek Lowe - Traded to the Indians. Nate McLouth - The Braves declined to pick up his option. He signed with the Pirates, the team the Braves got him from. Peter Moylan - Non-tendered. He just signed a Minor League contract with the Braves and accepted an invitation to compete for a job in Spring Training. Hopefully his back and shoulder are healing well. Eric O'Flaherty - Avoided arbitration. The Braves have him signed through 2012. Another yay! Martin Prado - Avoided arbitration. The Braves have him signed through 2012. George Sherrill - Free agent. The Braves chose not to pursue. Jack Wilson - The Braves had acquired him from the Mariners on August 31st to back up Alex Gonzalez for only the remainder of the 2011 season. The Braves recently signed him to a one year, as a backup infielder and a mentor to Tyler Pastornicky, the Braves shortshop of the future. Wilson and Pastornicky have been working out together in California in the off season. Larry Parrish - Let go as Hitting Coach. Scott Fletcher - Hired as an advance coach/assistant hitting coach. That's where things stand now. Your thoughts? The Baseball Hall of Fame's class of 2012 is a small one. It's a class of one but it is certainly a stellar class. Congratulations Mr. Barry Larkin! I always loved watching Barry play. He was a lifer who played the game right and he has done the Cincinnati Reds proud. I'm glad that he's in the broadcast booth now and I always enjoy his coverage and insight on the game. Barry received 86.4% of the vote. It was his second year on the ballot. No one else came close. I thought Jack Morris would do better. He wasn't always one of my favorite players as he was the architect of many nightmares in 1991 and 1992. Hopefully he'll do better on next year's ballot. Of the six Atlanta Braves on the ballot, only two garnered enough votes to remain on next year's ballot. Fred McGriff received 23.9% of the votes needed and Dale Murphy received 14.5%. Next year will be Murph's last chance. After that he'll only be able to enter the hall through the votes of the Veterans Committee. Before the ballots went out, Braves President John Schuerholz sent a letter of support to the Hall of Fame voters, reminding them of the kind of player and kind of man that Dale Murphy was, and still is today. As you prepare to vote for the National Baseball Hall of Fame’s Class of 2012, please accept this letter in support of Dale Murphy. The Atlanta Braves organization is extremely proud of Dale’s outstanding accomplishments during an extraordinary 18-year Major League career, 15 of which were spent with the Braves. Not only on the field, but off the field as well, Dale represented himself and the city of Atlanta with the class and professionalism consistent with the ideals of Major League Baseball and the Hall of Fame in Cooperstown. Even today, he continues to be one of our game’s greatest ambassadors. On the following two pages, please review Dale’s remarkable accomplishments produced over what the Braves family feels is a Hall of Fame career. On behalf of our organization and Dale individually, I thank you for your consideration. Dale Murphy was the National League's MVP in 1982 and 1983. That is quite a feat when you consider the Braves teams of that era. 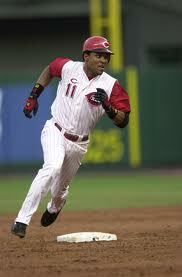 He was voted to the National League's All Star team 7 times and he was awarded 5 Gold Gloves. His career stats include a .265 batting average, .346 on-base percentage, 398 home runs and 1,266 RBIs in 18 seasons, 15 of which were spent with the Braves. For those of us who grew up with the Braves and watched Murph play, we remember more than numbers. We remember an exciting player who we loved to cheer for during a time that there wasn't always a whole lot to cheer about. We remember a smiling guy who played hard and set a great example on and off the field. Dale Murphy wasn't glamorous and all of his flashiness was saved for the for the field. He was the kind of player that baseball cherishes and immortalizes. He is the kind of player and man that the Hall of Fame would be lucky to call a member. Chances are that Braves fans will be disappointed again next year. That's so ironic as Murph never, ever disappointed us. We hear it said so often. But when something happens to remind us, to prove it, our hearts break. They break for those who are gone and for those who are left behind. Kathy Porter's family's world changed in an instant on a beautiful Saturday afternoon. Kathy lost her life and her family's world was forever shattered. They were doing what thousands of other people were doing that day. They were going to the Chick-Fil-A Bowl. The whole family. It was going to be a wonderful day. It's hard to understand or even to try to make sense of tragedies like this. I believe that time and distance give us some sort of clarity but for some, those closest to the pain, it's never understandable. They simply learn to live with it. Even worse for the Porter family, is that they must suffer their tragedy publicly. The circumstances force it to be a newsworthy story that will be reported for months. My heart breaks for the Porter family. I hope that their faith and their love for each other sees them through.